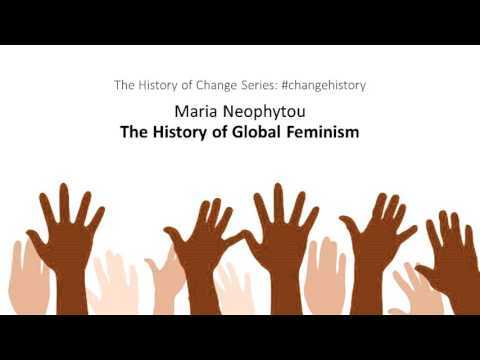 Guest post from Helen Elliot from Save the Children UK, on a talk by Maria Neophytou of the GREAT Initiative, as part of the #changehistory series of talks. You can listen to all the previous talks here. Last week a book that was the first of its kind was released, entitled “In Our Own Words: A Dictionary of Women’s Political Quotations”, edited by Nan Sloane (Centre for Women and Democracy). Why has it taken until nearly a century after women first got the vote in the UK for a collection of some of our most memorable voices to be recorded in one place? Many feminists would argue that one of the reasons is because, up until now, we have been learning about HIStory, a record of humanity written by and for men. Maria Neophytou of The GREAT Initiative brought this argument with her when she came to speak to staff at Save the Children on International Women’s Day. Maria raised some challenging truths about what it means to be a feminist in today’s world, and offered us a different perspective on the development sector and the potential for feminism to reshape it into something new. Who or what is it that we are disrupting? Many of you will have already read and hopefully shared the article recently published by Grayson Perry about the “Default Man”. The overarching point he makes is that it is a group of white, middle-class, straight, usually middle-aged men that holds the power in our society but that their time in the driver’s seat is starting to run out. This group of Default Men sit comfortably within the Patriarchy (a system of oppression of men over women) which has influenced how we all think and feel in ways we may not even be cognisant of. But feminism offers space to reflect and unpack our thinking. It welcomes difference and wants us to move away from binaries of male and female, celebrating differences and allowing conflict of opinion to exist. Waves – trough or crest? Feminism is now in its fourth wave where people are connected by technology and social media plays a critical role in challenging everyday sexism, misogyny and gender binaries. We’ve seen a significant shift in public attitudes about what it means to be a feminist in even our lifetimes. Maria speaks of how there were no feminist societies when she was at secondary school in the 90s, or at university 20 years ago. Nowadays, teenage girls and young women (and boys and men) have superstars like Beyoncé blasting strong feminist messages into their earphones in a language that makes sense to them. Being a feminist is suddenly not only cool, but is expected of young people. Meetup groups exist for feminists in every city across the country and Emma Watson is the face of the HeforShe campaign. Maria uses the fourth wave messages to raise questions about how we currently “do” development. The Millennium Development Goals (MDGs) were designed by Default Men, but the Sustainable Development Goals (SDGs) are a product of a more global conversation and their framework takes a more feminist approach, she says. But what about the aid architectures we operate within? Is it time to revamp the paternalistic approach to giving where strict criteria are decided by the patriarchy? Do we need to clear some space for more partnerships to enable more open, honest and more meaningful collaborations and changes to occur? Food for thought! And challenges remain in the fourth wave. Our children are up against a barrage of reinforcing messages about what it means to be a girl or a boy. Campaigns such as Pink Stinks and Let Toys be Toys are working to tackle the marketing industries to bring gender neutrality into products. Only 450 female MPs have been elected since 1918, while today there are 459 male MPs. Women still face harassment of various forms in their daily lives, which campaigns like Everyday Sexism is working tirelessly to change. And entire coalitions exist today to tackle violence against women despite there being a UN Declaration on the Elimination of Violence Against Women in place since 1993 and other incredible worldwide conventions and policies put in place for women’s protection (see the UN Women’s Timeline for a much needed uplift here). The discussion is left wide open for debate but I’d argue that right now we might be falling down towards the trough of the fourth wave, making splashes and spraying salt water in the faces of the patriarchy. But, we’ll soon rise up, stronger in our diversity to form a powerful crest which will be the fifth wave of feminism. What will it look like? Equality, hopefully! 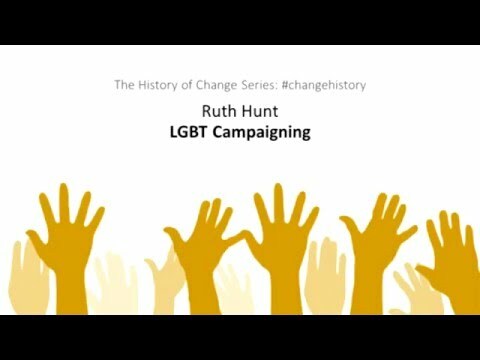 Guest post from Vic Langer, Campaigns Director at Save the Children UK, on a talk by Ruth Hunt, CEO of Stonewall, in the latest in Save the Children’s #changehistory series. You can listen to all the other talks in the series here. “It’s not about me, it’s about us”, this probably sounds like the sort of thing you imagine being uttered during relationship counselling; it is however the rallying cry to the UK LGBT community about what’s next in the journey toward LGBT equality issued by Stonewall CEO Ruth Hunt. It’s always good to have the opportunity to reflect on lessons from campaigning history and our lunchtime talk from Ruth Hunt to mark LGBT History month was no different. Rattling off a few key moments from history to demonstrate the long held societal anxiety around male sexuality Ruth sketched out for us the conditions under which Stonewall came to be, and what it was for. Established in 1989 against the hostile backdrop of Section 28, an offensive piece of legislation designed to prevent the so-called ‘promotion’ of homosexuality in schools, Ruth described Stonewall as an organisation focused on creating a pragmatic consensus in UK society. It was this consensus that saw the creation of “the good gay”, the presentable face of the gay male in the eyes of the mainstream. Quick to emphasise that for the large part this was a male movement, a white, elitist one at that, at one point she quips the lesbians were “off making the tea”. So how did a these gay men achieve full legal equality in the UK? Through assimilation! These were clean cut, monogamous, home owning, employed men looking to get hitched, settle down and start a family. All they wanted was normalcy. The narrative was set; there was “nothing queer about being LGBT”. I know from my own experiences of attempting to navigate the politics of the LGBT community that this approach isn’t without controversy. The impact on LGBT people of moving not against but into heteronormative discourse has been the subject of hours and hours of debate. Reflecting on whether assimilation was the right approach Ruth is clear – that’s something for history to decide. A history that had her a few minutes earlier reeling off the wins secured over the last 20 years. Equal immigration rights, equal age of consent, the repeal of Section 28, civil partnerships, legislation to stop discrimination against LGBT people around goods and services, the list goes on. It’s an undeniable fact that through the assimilation approach full legal equality has been achieved, I guess the thing that history will decide is whether the cultural trade-offs were worth it? Did LGBT communities even want to assimilate? One thing that is clear is that legal parity is a far cry from social acceptance, and so the struggle continues. Now Stonewall’s challenge is how to get their supporters to share their equality gains with others, hence Ruth’s mantra of “it’s not about me, it’s about us”. For her it’s time to diversify the public consensus from what it looks like to by gay, to what it looks like to by LGBT, to be black and lesbian, to be working class and trans. Diversity was one of Ruth’s top tips for campaigners because different people resonate with different audiences and it’s her view that long term social change happens when you have consensus from the widest possible base. A clear reminder to all of us campaigners and activists was the advice that no one cares as much as we do, we care more about the issues we campaign on than anyone else, and even then if we are honest there are moments in our day when it’s time for even us to switch off. That brings us to clear communications – make the headline, keep your points crisp. Clear to highlight that this takes discipline she underlines that it’s our job to spell it out to our audiences in ways they both understand and have time for. She’s also keen to emphasise that counterintuitive partnerships yield extraordinary results. Making the decision to work with Paddy Power was a risky endeavour for Stonewall, there were moments when they could have been just one tweet from catastrophe, but in the end the partnership was powerful because it reached a section of society that would have continued to be unreachable without such collaboration. There are no apologies made by Ruth for Stonewall’s collaborative, mainstream, working with you – not against you approach. The organisation will never be on the outside shouting in, it lives firmly in the mainstream but that doesn’t mean a refusal to challenge the status quo. Ruth recognised throughout her talk that the future is about creating a wider movement for social equality, that there is much work to be done in society around race and gender. As she comes to a close she shares that she has to think a lot more about the decisions that she makes because she is a woman leading Stonewall – but sadly we were out of time so there is no getting further into that issue, which is a shame because I wanted to ask if the lesbians are still busy making the tea? 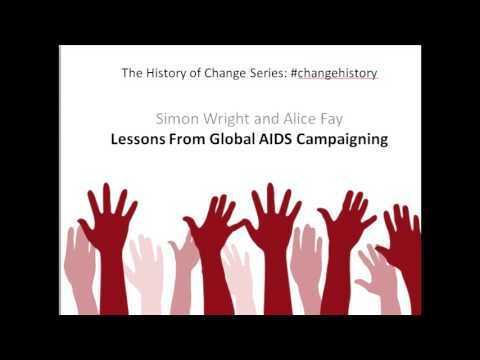 Guest post from Jack Wilson, campaigner at Save the Children, reflecting on a talk by Simon Wright, head of child survival policy, in the latest in Save the Children’s #changehistory series. You can find out more about the series here and here. ‘I’d shoot my son if he had AIDS’ says Vicar. We’re in 1980s Britain and what was initially termed Gay related immune deficiency is causing increasing alarm. As the first appellation suggests, fears over HIV and AIDS were strongly linked to homophobia. Indeed, with very little research being done into what was causing the spread of the disease, information was scarce, leading to a void which was readily exploited by other agendas. This discrimination expressed itself most controversially in people being sacked. This set the scene for the first HIV/AIDS campaigning efforts. At first national, then global, campaigning for the response to HIV/AIDS has arguably been one of the most successful development movements in living memory. Below is a short summary of how the campaign developed over the past three decades. At this time, no treatments for HIV were available. Thus the initial response very much focused on prevention through information dissemination via networks and community groups, with the emphasis on educating about the risks. These early efforts were often led by gay activists who felt a need to respond to what they felt was just the latest in a series of discriminatory attacks on their communities. By 1986, the UK government was finally beginning to take notice. Norman Fowler, then Secretary of State for Health, initiated efforts to mainstream the issue of HIV/AIDS. The message was clear: HIV affects everyone, gay or straight, get tested. Because of certain prevailing attitudes, Fowler understood it was important to dissociate HIV from gay men. This more rights-based approach that took shape in the late 1980s was aimed squarely at reducing harm. Despite this obvious progress compared to the beginning of the decade, the mainstreaming of the issue into broader society would prove to be a double-edged sword. The message that HIV affects everyone had gotten out so well to the rest of society that efforts to directly target gay men, still by that stage the most affected, were dropped. From this time onwards, campaigning efforts became increasingly led by those living with HIV. Activists in the US in particular became renowned for their confrontational tactics at getting the issue of treatment access on the political agenda. The events in the 1980s and 1990s set the scene for what was to come next – the shift to a global campaign led by both international governments and NGOs. The perception that HIV/AIDS was now centrally a development issue was born out of the staggering data showing that in some countries 20%-25% of the entire adult population had HIV. Suddenly fears that the economically active sections of these societies could be wiped out forced the issue onto the international political agenda. In 1996, UNAIDS was formed, recognising that HIV/AIDS needed a much more coordinated global response. In 2000, the UN Security Council held a meeting on HIV/AIDS, the first time it had discussed a non-conflict related issue. By 2003, the G7 had agreed to finance the Global Fund targeted at HIV/AIDS, TB and Malaria, while at the WHO Jim Kim was leading efforts to scale up treatments of the disease in poorer countries, along with prevention and care programmes. By this stage over 40 million people worldwide were carrying HIV. With governments now taking notice, efforts in some countries switched to the companies refusing to lower the prices of anti-viral drugs. Most infamously, campaigners in South Africa successfully forced a number of pharmaceutical companies to drop a court case that aimed to prevent the government from licensing and importing cheaper generic HIV drugs. The court case was a highly symbolic win for HIV activists and the campaign resonated around the world. AIDS was now a social justice issue. The wider reputational damage to the big pharma companies was substantial, the ripple effects of which are still being felt to this day. Ultimately, the Treatment Action Campaign in South Africa proved immensely successful in bringing down the prices of anti-retrovirals. Much like their radical predecessors in the 1980s, South Africa was another example of the power of campaigns who found their energy from those personally affected by HIV. HIV campaigning had now come a long way. There was increasing optimism that the international community was getting its act together. Inspired by these campaigns, NGOs in the UK decided this could be a moment to push the UK government to focus on HIV treatment. Cue the Stop AIDS Campaign and Make Poverty History. There are lessons on those at an earlier #changehistory talk here. Efforts led by ActionAid resulted in hundreds of thousands of signatures being collected on the issue of HIV treatment that were sent directly to No 10. This then gave the mandate for the UK government to push action on HIV/AIDS treatment for all as an outcome at that year’s G8. Health must be about empowering communities to change things for themselves, not telling people what to do. Health is a right. Once this is agreed, you start to plan and act very differently. In the case of HIV/AIDS, it helped to further the perception of a gross sense of injustice. The vested interests can then challenged by those arguing for rights. Mobilising by people who were living with HIV proved immensely powerful but not something that has been easy to replicate.